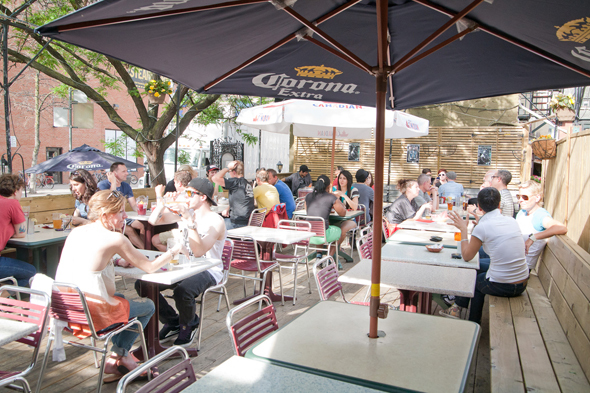 The top patios for World Pride in Toronto are reliable standbys in the Church-Wellesley Village - beloved summer-long spots for a beer and a snack in the sunshine. But this time of year, they're the perfect spot to soak in the electric atmosphere, watching Torontonians pour into the streets in celebration of our queer community. 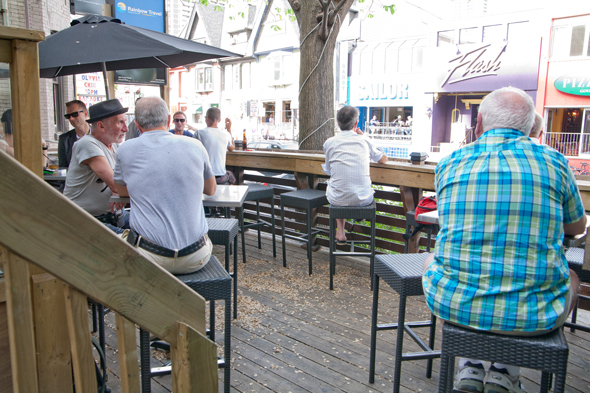 The people-watching is unmatched along Church St., and if you're taking part in one of the parties and events set to rage on in the city between June 20 and 29, there's no better way to take a breather. Pro tips: Be patient, and get there early. 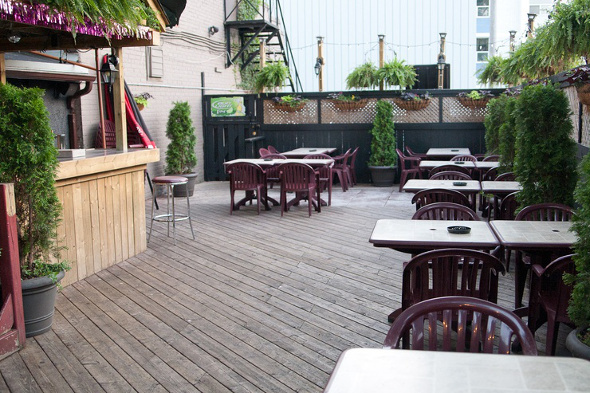 Otherwise, check out our patio guide and app for dozens of perfect plan B patios all over the city. 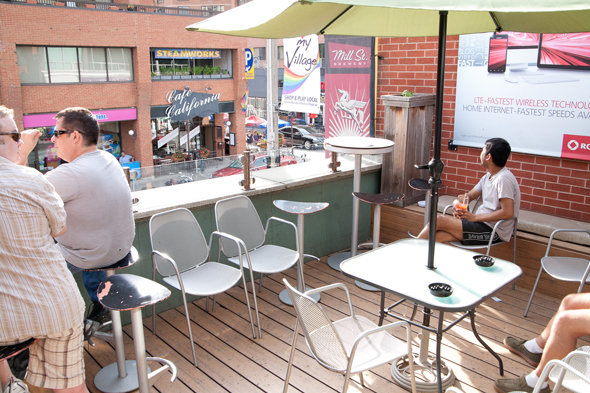 Here are the top 10 patios for World Pride in Toronto.. The newest name on this list is actually two. Coming from the people that brought you Smith and 7 West, House and Maison are a full-service restaurant and a cafe, respectively, opening just in time for Pride in the former Old Vic Public House at Church and Gloucester. 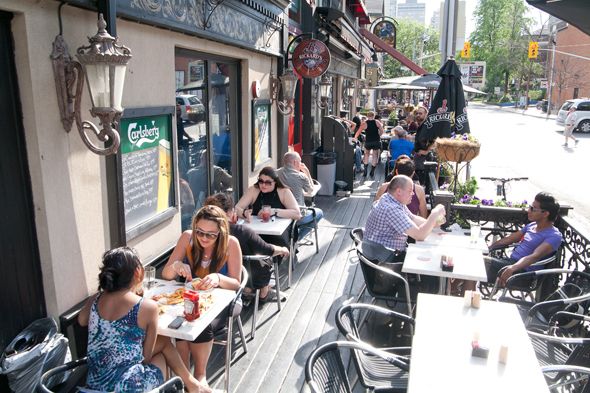 The Vic's sprawling patio, thankfully, remains intact - name change or not, it's still the Village's best place to soak up some rays. The patio at Statler's Lounge is perhaps the most exclusive on this list, with room for just 14 people. In short: keep those elbows out and your eyes on the prize if you want to snag a spot. The second floor patio lets you gaze out over Church, with a musical backdrop provided by the live performers below. It's sunshine and a soundtrack; what could be better? 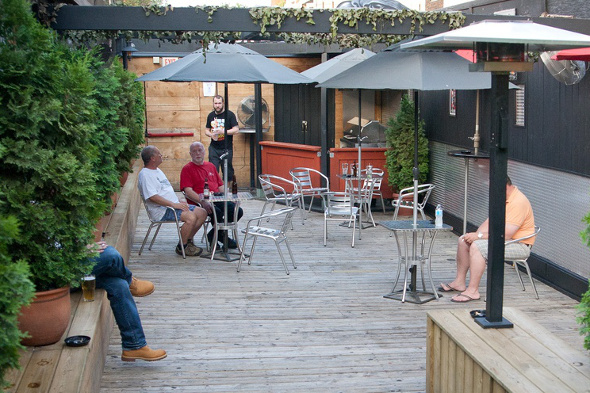 Crews & Tangos can get pretty wild on occasion, though its back patio is known to offer a space to kick back - during the day, at least. With space for close to 100 people, the patio offers drinks from its own outdoor bar as well as burgers and wings grilled up fresh out back. Count on the party spilling out to the patio on weekends. The recently-revamped Churchmouse & Firkin is one of the few places in the Village than can rival O'Grady's in terms of patio activity. 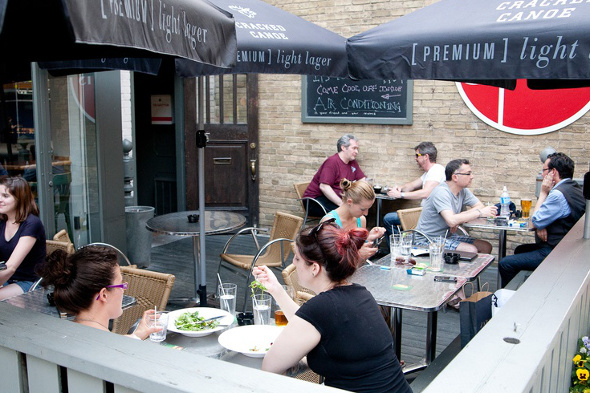 Yes, this pub is just one among many in the Firkin empire, but Churchmouse distinguishes itself with superior patio service and overall great ambiance. And the food is said to be not half bad either. There's always a conversation or two going on between those seated on the patio and passersby leaning against the rail. Count on slow pedestrian traffic on Maitland. 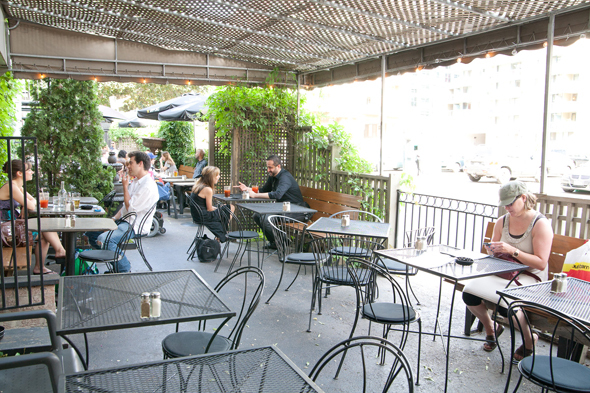 Black Eagle's patio is lauded less for the voyeuristic opportunity it affords than its abundance of leather fetishists. That is, don't expect much people-watching here, unless you're keen on locking eyes with the person to your left. And with leather chaps, open vests, tank tops, kilts, and hoods, why would you really want to look anywhere else? This upstairs patio is mostly uncovered (smokers, thus, can assemble) and hosts a Sunday barbecue every week. Hair of the Dog offers the best of both worlds at the foot of the Church and Wellesley Village and a stone's throw from Ryerson's campus. While the patio technically faces a parking lot, you still feel among the action without the constant annoyance of exuberant passersby. The patio can be equal parts sun and shade during the day, allowing you to arrange you party based on skin sensitivities. Super brunch. Smith's new side patio is a fabulous hidden gem. The space has a romantic, elegant feel - especially at night, when strung lights overhead light up the enclosed area. You'll find bench seating, brick walls, fantastic goat cheese ice cream, and a cocktail list that features fun twists on old classics, like a bacon-infused Old Fashioned and a smoked-salt Negroni. Spirits Bar & Grill often hosts a business casual crowd both during the week for lunch and for an early evening pint. 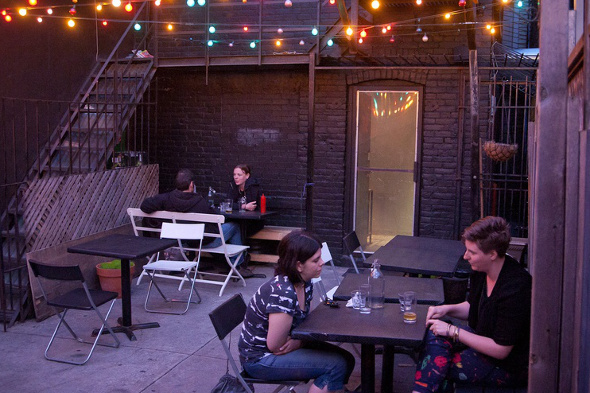 The front patio, while small, is the coveted spot for most Spirit-goers, while the more likely option is a table during a rush is on the double patio in the back (the fence helps to hide the adjacent parking lot). For those who are averse to barely-legal antics, Spirits Bar & Grill offers a bit of a respite in that it is largely undiscovered by the city's youngins. Kick back and relax, without fear of a scene by a carded under-ager. 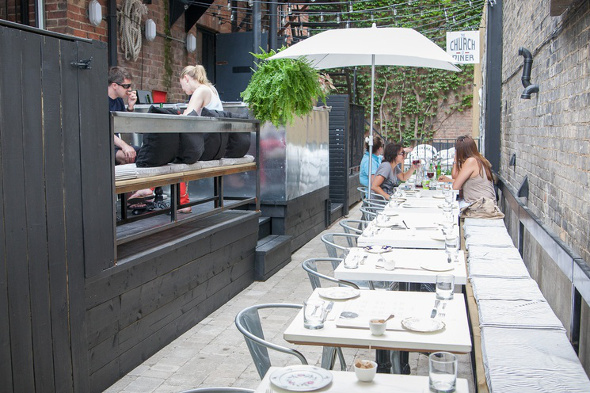 Boutique Bar's patio boasts people-watching opportunities that are a "step" above the rest. (That was a bad pun.) The slightly raised patio faces east onto Church and is typically lined with unabashed voyeurs. It has been said that there actually is space beyond the seats immediately hugging the rail, but the experience offered in that section is far less entertaining. Ah well, there are still those killer cocktails. Writing by Robyn Urback, Liora Ipsum and Natalia Manzocco. Photos by Jesse Milns.